HON and BSX Seating SPECIALS!!! 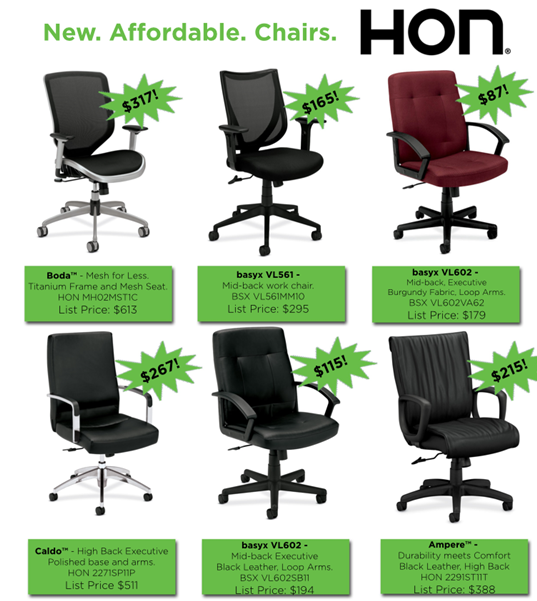 Kick start 2011 with a brand new Hon or BSX chair in your office! Hallmark Office Furniture is happy to offer reduced pricing on new and affordable furniture from Hon and BSX. Boda – Mesh for Less. Titanium Frame and Mesh Seat. Caldo – High Back Executive. Polished base and arms. basyx VL602 – Mid-back Executive. Black Leather, Loop Arms. Ampere – Durability meets Comfort. Black Leather, High Back. This article was posted on Tuesday, January 11th, 2011 at 7:40 pm	and is filed under Specials. Developed & hosted by DuoParadigms Public Relations & Design, Inc.